Red Fife Wheat Crackers for sale. Buy online at Zingerman's Mail Order. Gourmet Gifts. Food Gifts. Rescued mill makes rustic (and really tasty) wheat crackers. 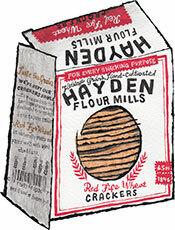 The Hayden Flour Mill was established in Tempe, Arizona back in the late 1800’s by Charles Hayden. Though Arizona may not sound like the ideal place to grow and mill wheat, many of the old varieties were hearty and thrived in the challenging conditions of central Arizona. Likewise, Red Fife is an old heirloom varietal of wheat that was widely used in North American baking in the 1800s. It all but disappeared during the Great Depression, when farmers started planting new, modern, higher yielding wheat varietals. But what we gained in efficiency we lost in flavor—Red Fife wheat has incredible deep, toasty caramel notes. To maintain the full flavor of the wheat, Hayden Mills grinds all of their grains on stone mills, which preserve the wheat’s natural oils—unlike industrial mills that burn the good stuff off. The flour all comes from small Arizona farms that don't use herbicides or pesticides. Their crackers are made simply with the fresh milled flour, a bit of oil to bind it together and some salt. The result is a clean cracker that highlights the flavor of the wheat that pairs perfectly with cheeses of all kinds.